The beginning of the new year normally coincides with change: we want to break bad habits, start new ones, replace broken things around the house, or do the things we’ve been procrastinating since last year. It’s a time where we look to improve ourselves and our surroundings, which makes it a pretty good time to redecorate the house, while we’re at it. To give you a little inspiration, we thought this would be a good time to put together a list of the top 6 home decor and interior design trends coming up in 2018. Increased environmental consciousness created a new design trend that’s taken root in the last few years and is now finally in full bloom - all puns intended. 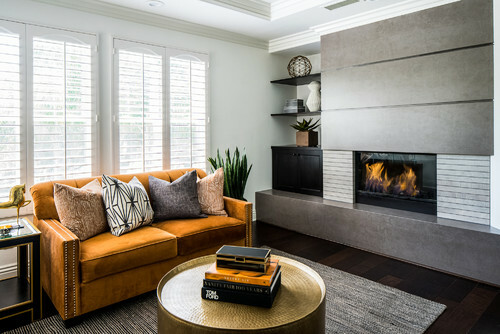 We’re seeing more and more natural materials being used throughout the home, whether it be stone walls, leather couches, wood and all sorts of plants and greenery. Perhaps it’s time to splurge on a natural edge dining table or a unique mirror and don’t be afraid to actually bring the outdoors in with some natural plants or by creating an indoor garden. With extra large TV sizes and even projectors becoming affordable in the last 10 years, creating a theater in the comfort of one’s home was a huge trend and a must-have that no longer require living in the lap of luxury. Its short-lived charm eventually made this room rather useless, however, so naturally it had to evolve. Entertainment spaces have taken the place of home theaters because they’re multifunctional - they allow you to sit down and enjoy a good movie with family or friends, but also hang around, chat and play games. Creating this functionality is very simple with the use of versatile furniture like a bar or a great TV unit. Gone are the days of greige! While a room’s backdrop remains neutral, it’s time to go big or go home with some serious pops of color. Everything from couches, to ceilings and even tile is being splashed with color this year. We’re also seeing neutrals go darker and richer: greys are going charcoal, beiges are going brown. To add an instant brightness to any room, consider a unique recycled wood piece, like thisTV stand. It will easily integrate to most decors and be an interesting conversation starter! Stainless steel, chrome and bronze have been our staple metal finishes in recent years. While these are by no means going away, we’re seeing a greater variety of metals being used across the entire home. Brass is making its own comeback as well as copper and black nickel. Since metals are considered neutral, they can easily be mixed and matched. Fabric trends are over-the-top when it comes to pattern and material. Big and bold florals are still all the rage featuring vibrant and saturated color. While rich materials like velvet and suede are making their own statement. Don’t be afraid to go lush and luxurious on this one! If you put all of the previous trends together, there’s a particular style that slowly comes into focus: the exotic jungle look. 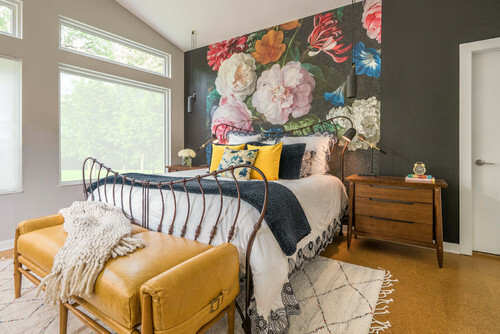 You can achieve this look by pairing earthy colors with organic materials like luscious greenery and vibrant pops of color (try yellow or orange) from bold floral fabrics. Worn timbers will bring all the pieces together to create a perfectly executed exotic decor.